Dom Pisa | Dombaumeister E.v. „The cathedral stands, secluded everywhere, in the vast, silent expanse of greenery enclosed by the crenellated walls of the Medieval town, that in such seclusion erected admirable monuments of its past life […] In that isolation, the snow-white cathedral, visible from everywhere, looks as if it had been shaped and completed by a vast, consistent creative gesture“. Art historian Pietro Toesca feels the strength and harmony that the cathedral conveys. The building is the fruit of an extraordinary human talent, supported by a deep civic awareness and a religious faith capable of shaping a civilisation. And a cathedral does not appear as if by magic, it is a goal, a deliberate achievement. The importance attached by the people of Pisa to the building of the Cathedral can be read in the epigraphs that are still embedded on the façade: the tombstone of bishop Guido, who began building it, funded by the fabulous loot that the people of Pisa took from the pillage of Palermo in 1063, the tombstone of Buschetto, the first ingenious architect, in which the building is called “a temple of snow-white marble“, and the one that tells of the anti-Saracen battles of Reggio, Sardinia and Bona, in Africa. Founded in 1064 and consecrated with great pomp on September 26th 1118, the Cathedral was built in two stages, one by architect Buscheto, who created the original layout with the basilican body with four aisles and one nave, a transept with one nave and two aisles, and the dome on the cross vault, and one by Rainaldo, who extended the building and the façade. The building was not finally completed until the last quarter of the XII century, when Bonanno’s bronze leaves were placed on the central door, which were later destroyed by the devastating fire of 1595, after which many of the destroyed works were replaced and a vast decorative plan was started. 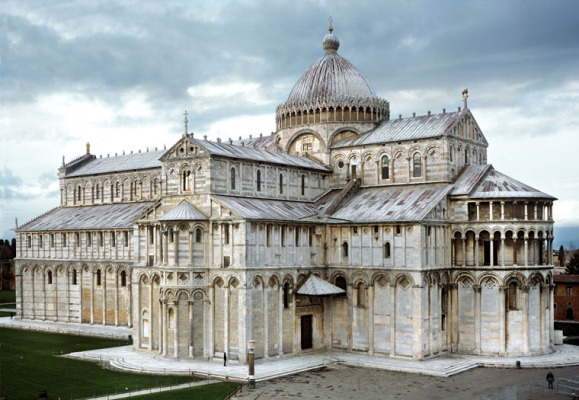 The outer facing of the Cathedral is decorated in alternating black and white shades in stripes of Arab influence and a massive use of reused materials from Roman monuments that emphasised the greatness of the city of Pisa, „altera Roma“. Such decorative features as lozenges, a bronze griffon of Islamic manufacture on top of the roof, and other Oriental-looking features, such as the elliptic-plan dome, rooted in the Mediterranean culture of the city and the architect, add shape and colour to a monument that is as much extraordinarily new as it is ancient. Original mortar for filling joints and costruction: slaked lime with marble dust, sand and brick dust. 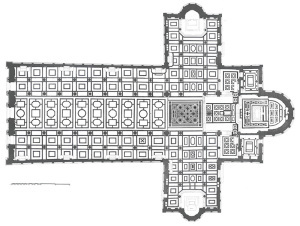 Inside, the nave is edged by two rows of monolithic columns made of granite from the Isle of Elba, flanked by four aisles separated by smaller colonnades with large women’s galleries on top, covered by cross vaults and looking out onto the nave through some double-lancet and four-lancet windows. The nave is covered by a wooden coffered ceiling that in the XVII century replaced the original exposed trusses. Rich and sumptuous are the decorations in the Cathedral of Pisa, the development of which is related to an often-troubled history marked by often-calamitous events that culminated in the fire of 1595. The only remains of the important commissions that completed the decoration of the Cathedral in the early 14th century are the mosaics on the apsidal conch – where Cimabue painted the figure of Saint John the Evangelist (1302 ca.) 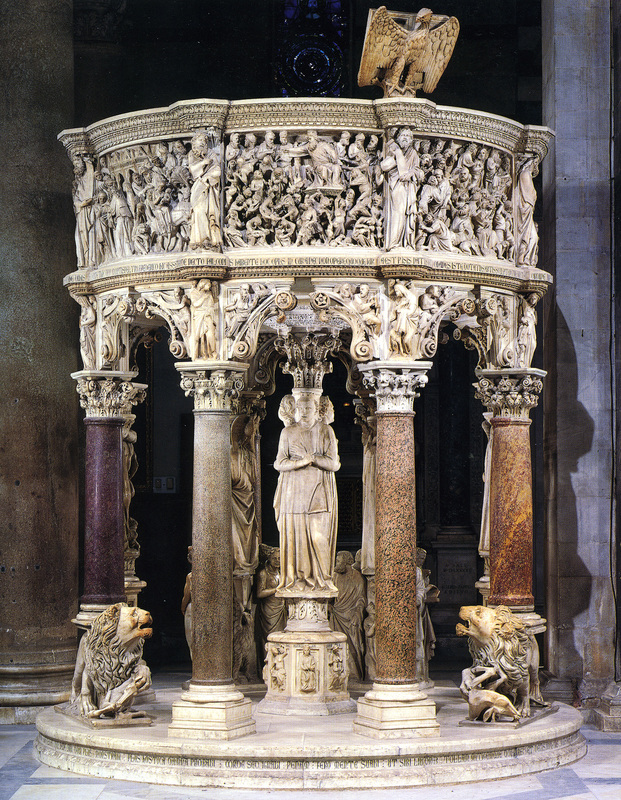 – the new pulpit (1302-1310) by Giovanni Pisano and the disjoined sepulchral monument to Emperor Henry VII (1315). The risky situation that had been noticed in the Tower and that had led to closing it down drove the experts to immediately take temporary, reversible measures that would increase safety and give them time to complete their surveys and studies before planning the final measures. From a geotechnical point of view, due to the fact that the Tower continued to move by approximately 1.2 millimetres a year, this meant fitting the monument with a counterweight consisting of heavy lead bars (May 1993 – July 1994). The bars (weighing a total of about 700 tons) were placed over a concrete ring and installed on the northern side, between the pillars of the first row, slightly more on the west side; they were laid down one by one, at appropriate time intervals. During and after the application, the inclination of the Tower actually went back north, for a total of 48 seconds of an arc. 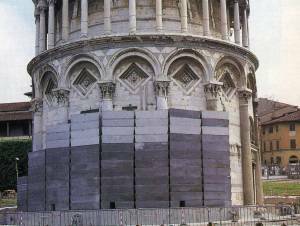 As a structural precaution, in 1992 the second order (just below the first moulding and on the outer facing of the first open gallery) was fitted with hoops made of steel cables to prevent the existing cracks expanding and the instability of the marble facing increasing. At the end of the stabilisation work, the hoops installed in 1992 were replaced with similar but less visible hoops. 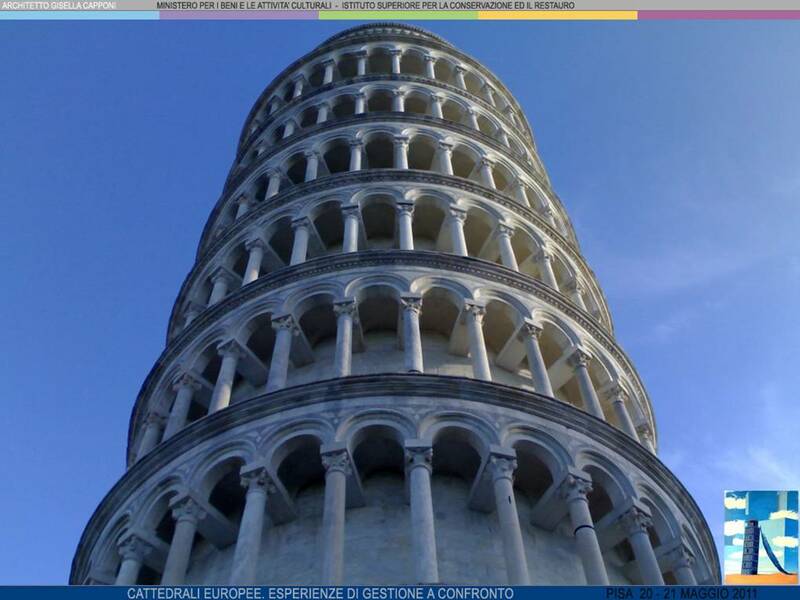 From a geotechnical point of view these surveys and studies suggested that a slight reduction in the inclination of the Tower (a ‘return north’ by about half a degree, i.e. about one tenth of the inclination measured in 1990) would have been sufficient to halt the inclination and improve stability in the long term. This would have also reduced the stress on the walls and would have minimised the strengthening work. The system selected to ‘straighten’ the Tower was the under-excavation, i.e. the controlled removal of specific amounts of soil. A number of pipes were driven slantwise into the ground and pushed until they reached the foundations; acting as drills, they dug out the soil proportionally to their size. After removing the pipes, the small cavities left in the ground were slowly plugged up by the pressure of the soil, causing a minimal subsidence on the surface. This technique was used in the area north of the Tower and it caused the Belfry to ‘fall back’ northwards, thus decreasing its incline. This extremely delicate operation was calibrated and adapted to the local circumstances and carried out in stages, to give the soil time to strengthen between extractions. 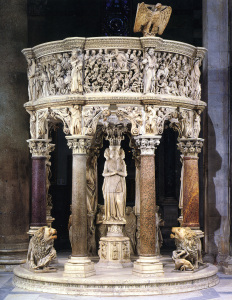 Of the many proposed techniques, this had the advantage of being ‘invisible’ and not altering the appearance of the monument. 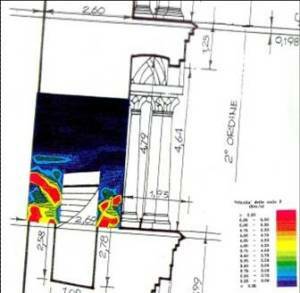 After the first laboratory surveys and tests that began in 1994, a large-scale experimental under-excavation was conducted in 1999 in a designated area of the square, between the Cemetery and the walls. The experiment was successful even if it confirmed, as already observed in laboratory conditions, that there was a ‘critical line’, i.e. a point beyond which the effects of the under-excavation became negative: in other words, the Tower would lean southward again. In 1997 the experts decided that, before conducting any test on the Tower, a safety construction should be set up for fear that something unexpected might occur. So the Belfry was «guyed», i.e. anchored to the ground by two big steel cables wrapped around the third order of columns and secured to two anchoring devices. Installed loose, the guys could be tightened up at any time, if needed. After installing the guys, February 1999 saw the beginning of a preliminary under-excavation, slower and more distant from the foundations than the final one. The result was remarkable: even after finishing the soil-strengthening operation, the Tower kept moving northwards, to such an extent that in September 1999 it had ‘moved back’ by 130 seconds of an arc, going back to its 1968 inclination. Then some of the lead bars began to be removed and from then on the Tower stopped moving (except of course for its ‘natural’ and seasonal cyclic movements). The final under-excavation took place between February 2000 and February 2001. 41 inclined drillings dug out 38 cubic metres of soil, 70 per cent north of the foundations and the remaining 30 per cent underneath them. During a break in the operation, in August 2000, some lead bars were removed and the ‘postponed’ effect of the under-excavation actually managed to prevent the Tower from moving back southward. The remaining bars were removed in January 2001 and the guys were removed in June. So the Tower ‘straightened up’ by half a degree, as planned. The current situation is the same as it was about two hundred years ago, before the excavation of the conch in 1838-1839, and it will presumably stay like this: even if the Tower started to lean again by as much as 6 seconds of an arc a year (a ‘worst-case’ scenario that the geotechnical engineers consider unlikely), it would take 300 years before it went back to the way it was in 1990. All this has been done without visibly altering the appearance and nature of the monument. 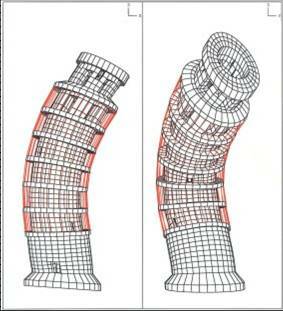 The purpose of the final structural work was to increase the resistance of the critical areas. This was preceded by a vast battery of structural studies and surveys that provided an extremely detailed map of the ‘health’ of the Tower prior to the strengthening work; this may be useful as a baseline to assess any future change. These studies were based on a full architectural survey, which located the ‘critical’ cracks for the installation of the monitoring detectors («deformometers») which ‘spy’ on any enlargement of these cracks and any deterioration of the state of the structure. A comparison between the new survey with the one of 1965-1971 showed that new cracks have appeared since then in the south-western section and on the stair steps, in the marble facing, in the vaults of the open galleries and in rifts in the lintels of the open galleries. Between 1990 and 1994, this stone-by-stone mapping was completed by a number of non-destructive tests and other experiments in the body of the monument to find any cavity or void that was not visible to the naked eye. 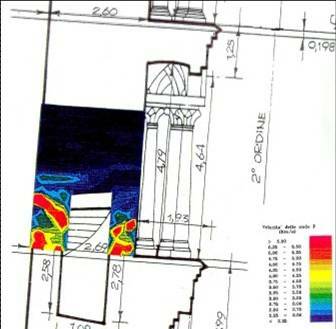 To do this, the results of different tests had to be combined: infrared thermal imaging, which shows up any cavity in the wall by measuring thermal differences on the surface; radars, which reveal any cavity or fracture based on the reflection of electromagnetic waves from the walls; sonic tomography, i.e. the measurement of the time the sound takes to travel through the wall; colour endoscopy through small surface holes, called «cores», made in the wall from the outside; and the sampling of materials. The movements of the Tower were also reconstructed and measured in ‘normal’ and exceptional conditions: for instance, movements caused by changes in temperature during the day or during the year (due to the thermal dilation and the cooling of the stones at night, the top of the Tower moves in an ellipsis over 24 hours) or by the effect of an earthquake, which was simulated by installing some vibrating masses on the Tower. The result of these and other measurements is the so-called «dynamic identification» of the Belfry, showing how it responds to winds or earthquakes. The one specifically conducted on the colonnade showed the response of each column to such stress. The final structural work took place in 1998-1999. In the ‘critical areas’ of the first and second levels under the pressure of the inclination, the wall was strengthened by injections of mortar and the installation of stainless steel bars; identical bars were also used to strengthen the lintels of the open gallery and their connections to the outer facing of the Tower. The temporary hoops were replaced with less visible ones, made of stainless steel wire, 4 millimetres in diameter. To retain and increase the stability of the conch, the outer wall was strengthened; in addition, a number of steel cables were buried all around the Belfry, under the floor of the conch, and pre-tensioned to strengthen the connections between the conch and the Tower. 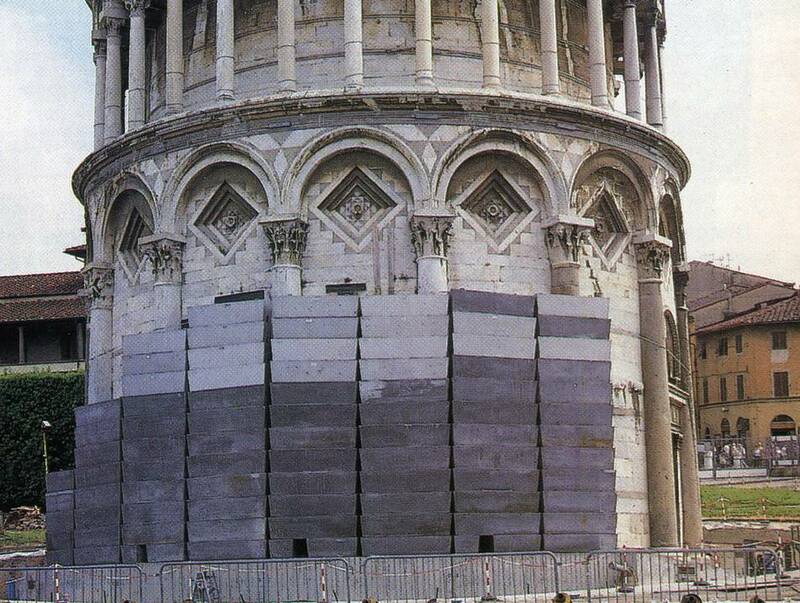 In 1991, with a view to working on the Tower for the first time, the experts realised that there were no appropriate instruments to measure the short-term response of the monument to such work. The Girometti-Bonechi inclinometer and the Civil Engineers’ level that had been working since 1934, was not able to provide reliable information except in the long term. For this reason, a new monitoring system was designed and installed and was left in situ even after the end of the work; it will continue to provide information to measure the health of the Belfry under any condition. The new system provides static and dynamic monitoring. Static monitoring is currently provided by four groups of instruments. 1) Three wire pendulums and some telecoordinometers on four levels, which, by detecting the horizontal shifting of any points on the outer surface of the Belfry, show any shifting of the vertical axis of the monument. 2) Ten electric deformometers measure any change in the cracks of the structure under normal conditions. 4) Five accelerometers record any vibration of the Tower under the effect, for example, of seismic winds. This complex system provides the exact picture of the state of the Tower at any time. In addition, over the last few years, it has provided information on the movements and alterations that the Tower undergoes in normal circumstances, depending on the cycle of the day and year, or any change in temperature, solar radiation, and wind. Of the roughly 1500 square metres of painted surface that used to decorate the walls of the Monumental Cemetery, a compendium of Medieval and Renaissance art and culture, only a few were spared by the disastrous fire that devastated the monument in 1944. The delicate restoration works that were still in embryo just after the War and became more careful in the following decades, well thought out and preceded by thorough surveys and studies, now enable us to admire again some of the scenes that composed such a grand cycle of paintings. 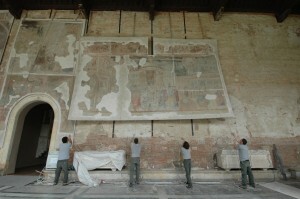 Now back in their original positions, we have the 14th century scenes of Job’s Stories painted by Taddeo Gaddi on the southern wall of the building, many of the scenes of the eastern wall, with the impressive Crucifixion by Traini, the lifting and replacing of which required accurate operations that were brilliantly carried out by the staff at the Opera. The northern wall, as far as the Ammannati Chapel, now hosts again the paintings by Piero di Puccio, whose biblical stories, which could not be completed because of the Florentine occupation, were finished by Benozzo Gozzoli. They are dominated by the vast scene of the Theological Cosmography, next to the Stories of Adam and Eve, of Cain and Abel, and Noah’s Ark. 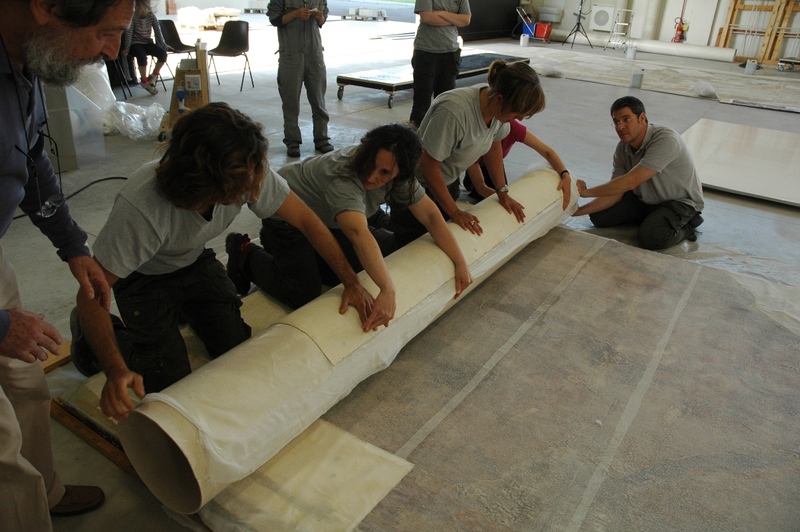 Amidst the latest feats of the restorers’ team, one worth mentioning is the pictorial restoration and the transfer from the temporary backing to the fibreglass backing of the four sections of scene no 34, the Building of the Tower of Babel, whose restoration was sponsored by the World Monument Fund, which received the plan as well as a detailed budget. 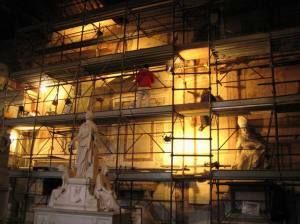 Over the years the restoration of the Monumental Cemetery of Pisa has made great progress, to such an extent that it has become an experimental laboratory to which scientific and chemical breakthroughs and cutting-edge technology have been applied. While in terms of conservation, an interesting study was the one on the use of live microbial cells (bacteria) to remove tough residues of animal glue that resisted the attack of traditional materials and that was used in restoring a painting by Spinello Aretino, The Conversion of Saint Ephisius, at this stage another very important innovation is the use of the Sistema Informativo del Camposanto Monumentale, a multimedia database that can be interfaced with the 3D model of the monument and can manage the three-dimensional rendering of all the items it contains. The virtual rendering of the building, created in the mid-Nineties to support the technicians in their restoration work, is now used for the preliminary repositioning of the frescoes, those operations that require a careful measurement of the wall scenes and the monuments behind them. The project management of the Cemetery now works as part of a far-ranging project which involves not only a large group of restorers but also some chemical research units in the diagnostics of organic and inorganic materials, and experts in atmospheric science for the microclimatic survey of the prestigious pantheon of local and national gems, which will have to outline criteria for the proper conservative management of the cycle of frescoes enclosed between the precious marble walls that are still under restoration. A conference held in March 2008 provided a wide discussion on what has been done so far, explaining the technical and methodological grounds of such work. 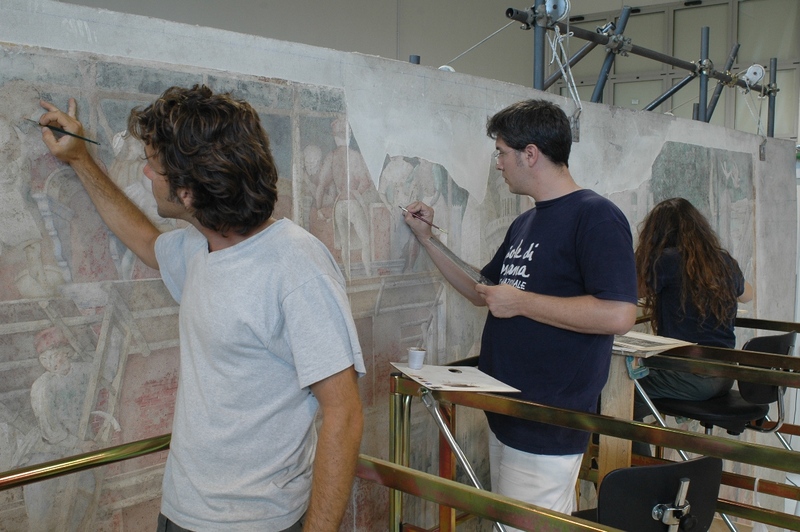 To promote an open, free but informed discussion, many experts (Italian and foreign art historians, chemists, physicists, petrographers, directors and managers of restoration schools) were asked to give their contribution to these sessions and share their opinions on plans and results, based on the results of the reports and the survey of the frescoes as the work progressed. In order to provide a direct experience this conference was held in an area specifically set up in the new restoration laboratories of the Opera Primaziale Pisana. “ […] for this Guglielmo, it is said, in the year 1174, together with the sculptor Bonanno, laid the foundations of the campanile of the cathedral in Pisa. 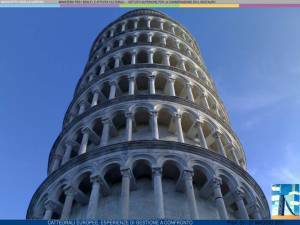 These two architects had little practice of foundations in Pisa and […] before they had reached halfway with the building it inclined to one side, so that said campanile leans six and a half braccia from its vertical […]“. This is how, in his mid-sixteenth-century Lives of the Artists, Giorgio Vasari explains the causes of the „male oscuro„, or „obscure evil“, which struck the bell tower shortly after work started. If the builder of the Tower, who in actual fact has yet to be identified, had realised he was laying the foundations on the banks of a long-gone river, he would certainly have looked elsewhere for a place to construct his monumental tower. But the Tower was destined to rise up right there, even though the curious choice of site remains a mystery: could it be that the way the buildings are located in the Piazza is a reference to the constellation Libra, and thus that it has a hidden astrological meaning? Or might it be because the patrons decided to place the bell tower right at the entrance to the Piazza? These are questions that are hard to answer today, but we do know that still today the Tower inspires amazement and admiration and that its circular plan creates an extraordinary interaction with the nearby apses of the Duomo and with the magnificent structure of the Baptistery. It is called the Leaning Tower or the Tower of Pisa but actually it was never used for defending the city; it is part of the religious complex in the cathedral square and acts as its bell tower. It played an active role in both human and divine timekeeping with its seven bells – one for each musical note – the largest of which, cast in 1655, weighs a full three and a half tonnes! 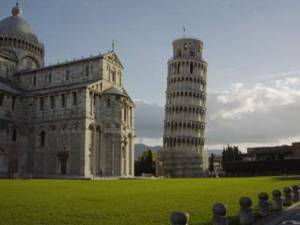 It is known throughout the world for the beauty of its architecture, for its extraordinary tilt, which makes it an authentic miracle of statics, and for the fact that it stands in the universally renowned Piazza dei Miracoli, of which it is certainly the prize jewel. And this is why it is one of the 7 Wonders of the World. Height: 58.36 metres – External diameter: 15 metres – Weight: 14,453 tonnes – Inclination: (current) about 5° – Hewn stones: 29,424 – Stone surfaces: 7,735 square metres – Capitals: 207 – Staircase: 296 steps. 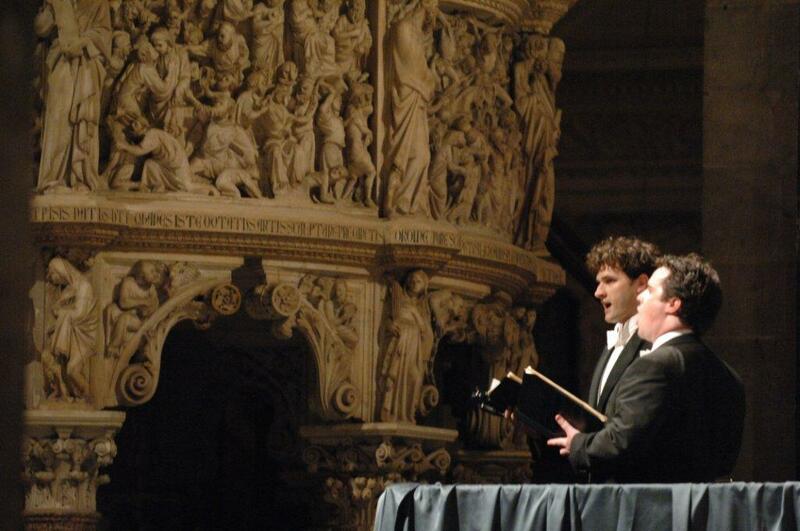 Inspired by an artistic idea put forward by Maestro Giuseppe Sinopoli, the International Sacred Music Festival „Anima Mundi“, which began in 2001, is one of the most important and prestigious events of its kind both in Italy and abroad. Its success, based on continuity and stability, is due to the Opera Primaziale Pisana, which made it possible to support and guide such an awesome feat towards utmost excellence. There was no such festival in Italy to showcase the musical masterpieces of all times associated with the concept of the „sacred“ in its widest sense through performances that could set interpretative, philological and critical standards. The unique beauty, solemnity and harmony of the Cathedral of Pisa perfectly fit, for its acoustic and ambient features, with music, and sacred music in particular. This journey of feelings and knowledge is vouched for by the great composers that devoted themselves to sacred music, from Palestrina to Monteverdi, from Bach to Mozart, from Schubert to Brahms and Mahler, through to the works of contemporary artists, who kept bearing witness to the hard quest and relation with the sacred in our age: of these and many equally important authors, „Anima Mundi“ has offered a wide, exhaustive picture, ranging across every aspect of the ancient and modern repertoire.